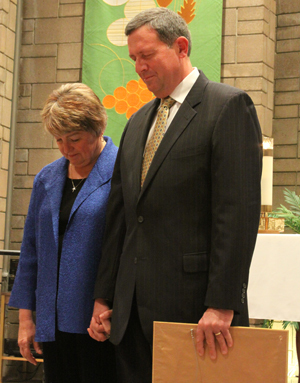 Last fall, the Redemptorists honored Jeff and Brenda Vredenburg with the title of Redemptorist Oblate. The honor is the highest bestowed by the worldwide Congregation on a layperson, and is given in recognition of a person’s commitment to the Redemptorist mission to preach the Good News to the poor and most abandoned. The Vredenburgs are college sweethearts who readily admit to having found a best friend in each other. The two musicians (she’s an organist, he sings) have spent most of the last 40 years serving as music ministers at the Redemptorists’ St. Clement’s Parish in Saratoga Springs, NY. Over the years, they grew to know and love the Redemptorists, especially through their volunteer work at the St. John Neumann Residence, the home for confreres needing skilled nursing care, which was located across the street from St. Clement’s until 2009. This pair of friends say they’ve found their own best friends in the Redemptorists. What role have the Redemptorists played in your own spiritual journey? How did you discover the writings and spirituality of St. Alphonsus Liguori?